A reception honoring Ben Schears, Cowley College vice president for institutional advancement, was held Thursday in the CornerBank Community Room in Arkansas City. 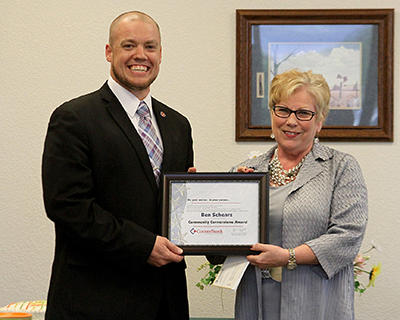 Schears was named CornerBank’s Community Cornerstone Award recipient in Arkansas City for April. In recognition of his service, Joyce McArtor, Community Bank President for CornerBank in Arkansas City presented Schears with a check for $100 to the non-profit organization of his choice. Schears chose the Cowley College Foundation for the Student Emergency Fund to receive this donation. Schears is an active leader, volunteer and cornerstone for the Arkansas City community having served on a list of organizations and spent many years at Cowley College. For the past five years, Schears has served as Cowley College’s Vice President for Institutional Advancement. Most recently, having achieved a lifelong dream, he accepted the presidency of Northwest Kansas Technical College in Goodland, Kansas, and will begin his time there on July 1, 2016. Although excited to begin his presidency at Northwest Kansas Technical College, Schears will miss the people of Arkansas City.